Homer area sourdough tells his story. 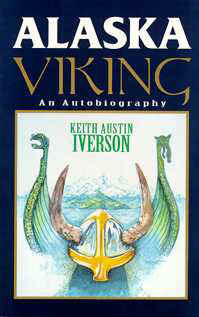 Keith Iverson is a 20th-century Viking. Like his early Norwegian ancestors, he set out in search adventure, but with no new lands to conquer, the battle he fought were with himself, nature, and the madness of the modern world. In Alaska Viking, Iverson recounts his breaking away from big-city life and heading to Alaska in search of a dream. His quest takes him to the remote fjord of Sadie Cove. There, in the Alaskan "Bush", he stakes gold mines, stalks moose for his winter meat supply, and kayaks perilous waters on routine trips to town. Since making a living in the Bush presents a great challenge, the "Mad Viking" devises some inventive strategies to support himself. He creates "Mooseltoe" from moose poop (a renewable Alaskan resource) and embarks on a National Mooseltoe Campaign that wins him national media attention as an "entremanure". His most satisfying venture is expanding his home into a wilderness lodge and entertaining guests from around the world. Iverson faces his most remarkable challenge when the Exxon Valdez oil spill shatters his sanctuary and he enlists in the cleanup effort, eventually becoming a field supervisor. This frontline battle in the global environmental struggle leads to his personal commitment to protect the land that he loves. Alaska Viking chronicles all these adventures in engaging detail and is a telling journey of self discovery that shines with hard won insights born of physical challenge, lost love, and the harsh demands of a wilderness life.